Handweaver’s Studio handspinning course | carpe diem! Sorry, this is a long post with almost no pictures (there’s another one at the end). It’s intended to remind me of what I learned, or at least should remember! There’s a lot – it’s a fabulously useful course – for only one day (10am – 5pm). I started by arriving early to assemble the weaving yarns I wanted. Nancy started by pulling a rolled raw fleece from Pongo, a Jacob x Texel onto the table. We handled/hefted the roll, assessing its smell (sheepy! ), lanolin content (too much is unpleasant, too little may not spin well), the feel of the wool, and the weight of the roll (too heavy may mean a wet or particularly dirty fleece, an off-centre weight may mean someone’s thrown in a few handfuls of sheepshit). Most sellers will not object to the removal of a small lock from the fleece: holding each end firmly, tug on the lock to see what the wool does: if the fibres snap, this indicates a weakness that makes it unsuitable for spinning (and thus unsaleable to the Wool Marketing Board: handspinners beware, some farmers may be selling reject wool). Then assess the fibre quality, the lustre and fineness. We opened the fleece up (it was huge, spreading to completely cover a 5′ long table, draping to the floor on either side), and explaining the anatomy of a fleece to us: at one end (usually) is the head and neck, where the seeds and grass are most abundant. Moving back down, the shoulders are next: slightly cleaner, fleece softer than anywhere else. own the middle is the back, more densely packed, drier (less lanolin), more sun-bleached, often with some vegetable matter. To each side the flanks, with locks of good fleece hanging in rows like shingles on a roof. Below that, on each side, the skirt, dirty, often slightly felted, could be best as compost. Behind the back is the rump/tail, which is the coarsest wool, often with lots of hair and relatively dirty. I liked the grizzled appearance of the dark wool and paler hair. Wool categories: Mountain and Hill (coarser, good for mattresses, rugs, loft insulation), Lustre Longwool (finer, softer fibres, glossy, often with curl), everything else (I didn’t write this down!). Different parts of the same fleece may look like fleece from different breeds. Put Pongo away, look at fleece from a variety of hybrids. See how different breeds produce yarns that feel different and behave differently when washed (a sample scarf, varying in width, also provided a good lesson on how to diagnose moth and what to do when you find it. The cocoons are very nearly invisible). Then a relatively brief description of what can happen to wool during processing. Dyed in the wool (a sample of lovely tweedy yarn, together with a bag of the bits from which it was spun, which looked like scraps of stuff that no one wanted to spin, short, slightly felted, some bright blue, some black, a lot of white from many breeds), vs dyed yarn, vs dyed in the piece garments. Machine-spun perfect yarn, and yarn machine-spun to look like handspun, suspiciously even with a kink every 2 inches. Out came a bag of fibre, again texel x jacob, and we were shown how to use drop spindles to spin in the grease, completely unprocessed fibre. Just pick a lock from the fleece, loosen the fibres by spread it carefully and evenly (which allows the dirt to fall away), feed a bit onto the leader yarn, and spin. It felt sticky and wiry – very different to my lovely smooth Blue-Face Leicester roving – a good and interesting experience. After lunch, introduction to carding. Place the fibre in the middle of the surface, leaving a 1″ margin all round and being particularly careful to stay away at all times from the handle side, as looping fibres around the pins here will create a ridge in the rolag. Avoid carpal tunnel syndrome: hold the handles in fists, without extending fingers. I need to practice carding. Do it to create an even, uniform fibre mass. If you want to retain the character of the locks, especially the bleached ends, spin from uncarded locks… example, a beautiful lap rug woven from hand-spun wool sheared after the summer of ’76 (one of the hottest, sunniest on record in the UK). 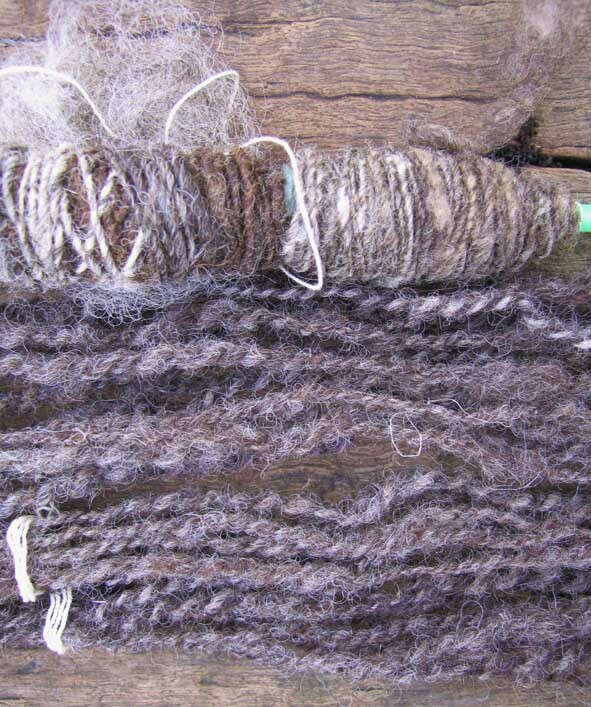 The warp was spun from the coarsest wool on the fleeces, yielding a beautiful, grizzled hairy yarn. The weft was the softer shoulders and flanks, softer, with the colours of the sun-bleached tips preserved by spinning from individual locks. Much of the brittle, bleached wool will break away during the first wash, but enough remains to make the colour variation visible. Woolen vs worsted, and a demonstration of the principles of worsted combing on a carder. When we’d carded enough to at least understand the principles, a bag of rolags appeared, and we were introduced to spinning in the grease on a spinning wheel. The mechanism is far simpler than I’d imagined, but the co-ordination is a bit more difficult… and it just eats wool. Even treadling as slowly as I could. The feel is feeding the yarn to the bobbin rather than let the bobbin pull it. With incipient yarn held gently between finger and thumb, slide the finger and thumb up the yarn allowing the twist to follow. The wonky skein in the photo is my first wheel-spun handspun. It looked very different before it was washed – lanolin makes everything a dark golden brown. 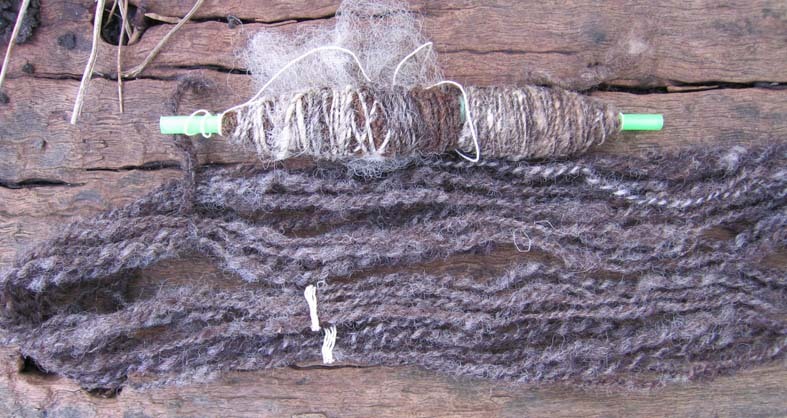 Principle is like handspun, clockwise rotation on singles, anti-clockwise to ply. We plyed by winding the singles into a centre-pull ball (Memo to self: BUY BALL-WINDER, it’s magic), then plying both ends. Count the treadles needed to put twist in an arm’s width, assess the twist (it should just gently twist back on itself), when satisfied, allow the 2-ply onto the bobbin. Continue to ply length by length. How to wind a skein, tie it. If for knitting, wash it. Hang very lightly weighted. If for weaving, leave to be washed in the fulling process. Bags of exotic fibre appeared, and we were encouraged to change the character of our original wool by carding in camel down, silk, tussah silk… and shown, quickly, the principles of spinning plant fibres such as flax and linen, and how to manage the long, smooth silk roving (I’d guessed right with mine, hurrah!). hey, when did the sun go down? It’s dark outside! 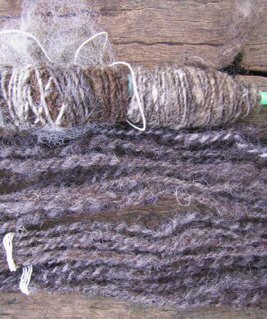 Run around frantically grabbing stuff, small carders for luxury fibres and sample bags of fibre to play with… camel down, silk noil, grey alpaca, a steel-grey alpaca/silk blend, grey-brown BFL, manx/silk (it felt soft and it’s soft pale grey-brown). I haven’t got photos of these yet, and I’ve got to go make the pizza dough. If something important about spinning isn’t mentioned here, chances are I jsut forgot to mention it. Here’s a close-up of the yarn I spun. The rightmost stuff on the straw is TxJ carded with silk and with camel down, spun on the drop spindle. There’s so little of it, I’ve no idea what to do… knit a tiny box or something, perhaps. I want to feel it, but it must be washed thoroughly. By the end of the class I no longer noticed the sheep smell, but when I arrived home the cats followed me everywhere, sniffing eagerly. Incidentally, cat ‘wool’ felts ferociously. Apparently it must be blended with wool, preferable merino, to make a very soft yarn. This entry was posted in Uncategorized on January 14, 2007 by sarahw. As regards types of wool, that sounds right. I was too busy feeling the fleeces, trying to understand what we were being told, to take notes. I forgot to mention ‘kemp’. Most of the fleeces at Handweavers seemed to have a lot of character, lots of colour variation (when examined closely). Which makes sense: why would a hand-spinner want to invest a hundred hours or more in processing a fleece that’s not memorable? I forgot to mention working from the underside of the fleece (closest to the skin) when separating a fleece into colours.As for knowing what to look for in a fleece… at least it’s a start. As I read bloggers’ descriptions of the fleece auctions at the big fibre festivals I wondered how on earth they knew which were the ones to buy (let alone what you do with it when you’ve got it home). Now I begin to understand… it’s about potential. What the quality is best suited to make, whether or not you like the colour now, and will like it when it’s washed. 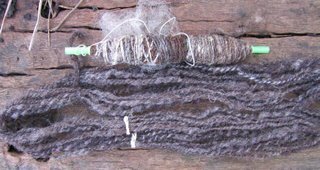 It was interesting: when we were picking locks to spin, I preferred the grizzled marly grey-tan, only adding dark chocolate brown because I thought the contrast would work when plied, and to see what the bleached ends did. The person across the table from me spun only the softest, darkest brown. The most beautiful fleece of all was not for sale, the last of one from ‘Fat Pat’, an elderly Wensleydale hybrid. Glossy, crimped, silk-soft, and an amazing variety of shades from grey through to white in every lock. They’ve had her fleeces every year for years, and each year they’re different. Sadly her teeth are giving out, so they’re hoping one of her offspring will carry on the good work.Problem about buying one is the size (the kitchen table is half the size of the one we worked on), and the smell. I’d have to work in the garage, spread it out on my car! I think I’ll start with a half or even quarter. I was intrigued by spinning from the lock to preserve the colour variation… so much to learn and do, so little time!